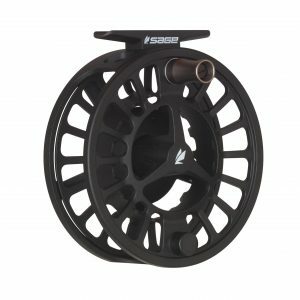 Sage has announced the upcoming release of the new SPECTRUM C reel series, featuring a larger arbor and die cast frame. BAINBRIDGE ISLAND, Wash. (July 11, 2018) – Completing the family of SPECTRUM reels introduced last year, Sage brings anglers the affordable yet performance-based SPECTRUM C in August 2018. The SPECTRUM C reel features a larger arbor with rugged yet lightweight die cast frame with a machined finish and a generous concave vented spool for strength and capacity. A powder coated surface protects from corrosion and wear. Equipped with the SPECTRUM family Sealed Carbon System drag package with One Revolution Drag Knob with numbered and detented settings, this reel family also has a fully machined drag knob and handle. The SPECTRUM C comes in 3/4, 5/6, 7/8 and 9/10 sizes and retails for $150 for the smaller two models and $175 for the larger models. With black or grey color options, it arrives with a neoprene and embroidered nylon reel case. Extra spools are available for $80 and $90, respective to the model size. Find these rods at IFTD (International Fly Tackle Dealers) show at booth 5079. Founded in 1980, Sage was created with one idea in mind—to build the world’s finest performance fly rods. From the start, Sage has maintained that singular focus on delivering the finest performance fly fishing rods, reels, and equipment to the avid angler. We are a company of passionate anglers and craftsmen, continually seeking performance advantages through new materials, designs, and engagement with the fly fishing community. We fly fish. You can feel our passion for fly fishing in everything we do. For more information, please visit www.sageflyfish.com. Facebook Instagram Vimeo.